Like millions of people, I need to keep an eye on my blood pressure. You can check it when you visit your doctor, but many people have “white-coat hypertension.” Just getting their blood pressure measured at the doctor’s office stresses them out, resulting in higher than normal readings. All the better reason to check it at home. A regular arm-worn blood pressure monitor is around $50. So at $130, the Withings Wireless Blood Pressure Monitor isn’t competing on price, but rather convenience. Saving money doesn’t matter if you don’t wind up using the device, and Withings’ version makes checking your blood pressure a lot easier. Withings had originally offered a wired blood pressure monitor: it connected to an iOS device’s 30-pin dock connector. You can still find some of these for sale, but if you have an iOS device with a Lightning connector, you’d need an adapter. The new wireless model uses Bluetooth, making it a cinch to use, and also offering Android compatibility. The device is a little awkward at first, but once I got the hang of it, I found it easier to use than other monitors. The device is bulky, with an aluminum tube that contains the hardware to pump up the cuff and the batteries, which is attached to the cuff itself. It’s an all-in-one device, with no tube connecting the hardware to the cuff. The cuff is rigid, and you have to pry it open a bit to get it around your arm; you then attach it with velcro and it’s ready to go. To take measurements, you first press a button on the blood pressure monitor, which wakes it up and launches the Withings’ Health Mate app on your iOS device. Then tap Start to have the cuff inflate and begin measuring your blood pressure. When it’s finished, readings display in the app: systolic and diastolic blood pressure, and your pulse. I found the device to be a bit finicky at first. I got measurement errors and had to restart. The cuff seems more sensitive to exact positioning than other devices I’ve used, but once I got the hang of positioning it, it worked fine. As for the Health Mate app, I find it confusing at best. Its display isn’t very intuitive, its Dashboard view shows the last reading and a vague graph, and its Timeline shows graphics that seem to have no relationship to your history. I wasn't crazy about the graphs in the Withings Health Mate app, but luckily I can view my data in other apps instead. The app does work with Apple’s Health app. You just open Health’s settings and choose to import data from the Withings app. Unfortunately, the Blood Pressure display in Apple’s app isn’t much better—it has white data points on a gray background, and isn’t very readable. The iBP app gave me the clearest picture of my blood pressure data—well worth the extra dollar. However, the $1 iBP Blood Pressure app can connect to your Withings account and download the same data. This app has a much better display, offering graphs with trend lines, timelines, and averages. You sign into your Withings account, them manually fetch the new data. You can then view the data in the iBP app, and easily export it in multiple formats, if you want to send it to your doctor. 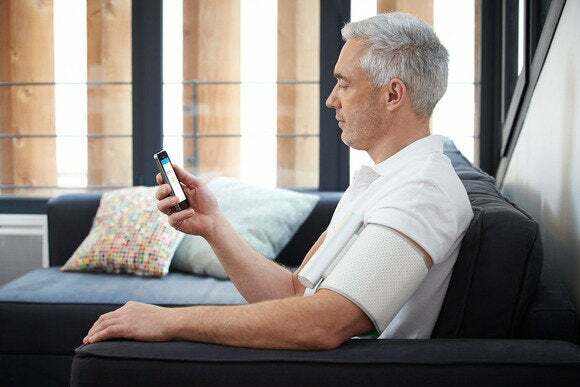 With this wireless blood pressure monitor, you’re certainly paying a premium for convenience, but it is much easier to use than standard devices. I’d have expected some sort of carrying case, as most blood pressure monitors provide, but there is nothing. If you don’t mind the extra cost, you’ll find that taking your blood pressure is less of a hassle. The confusing software drags it down a bit, but with the addition of the iBP Blood Pressure app, I find that it’s a great solution to keeping track of an essential health metric. If you don’t mind the extra cost, you’ll find that taking your blood pressure is less of a hassle.